This entry was posted in Writing notes and tagged black hoof fungus, correcting proofs, Fungus, mainstream publishing, Pen & Sword, Pen and Sword, small ruins, Surviving the Death Railway: A POW's Memoirs and Letters from Home by hilarycustancegreen. Bookmark the permalink. Thanks. Reading the proofs is unsettling as the book feels as though it has a very slow start. It is tricky with so many ‘voices’. No, I have never climbed the fence and looked into the building. I must next time! I think it would have to be a very small pump. I am very ignorant about fungi, so at least you have given me a category by calling it a shelf fungus. Thanks. Thanks, I’m in that uncertain phase at the moment. The story is inherently dramatic, but none of the writers are, so compared to a novel it reads slowly, at least at the start. I know I will buy one. And lend it to Mr. Corbeil to read. Once he had asked me about the people I had chosen to receive his souvenir card and peace message… I told him about you. Once I told him who you were, he never brought up the subject afterwards. Congrats, Hilary!! It’s an honor to be one of your followers! Happy New Year on the rise! Thanks, my efforts are as nothing to yours. Happy New Year to you! Congratulations and hugs, Hilary….I trust you will let us know when and where we can get a copy. Thanks, it is out this coming spring/summer, but I don’t yet have a date. 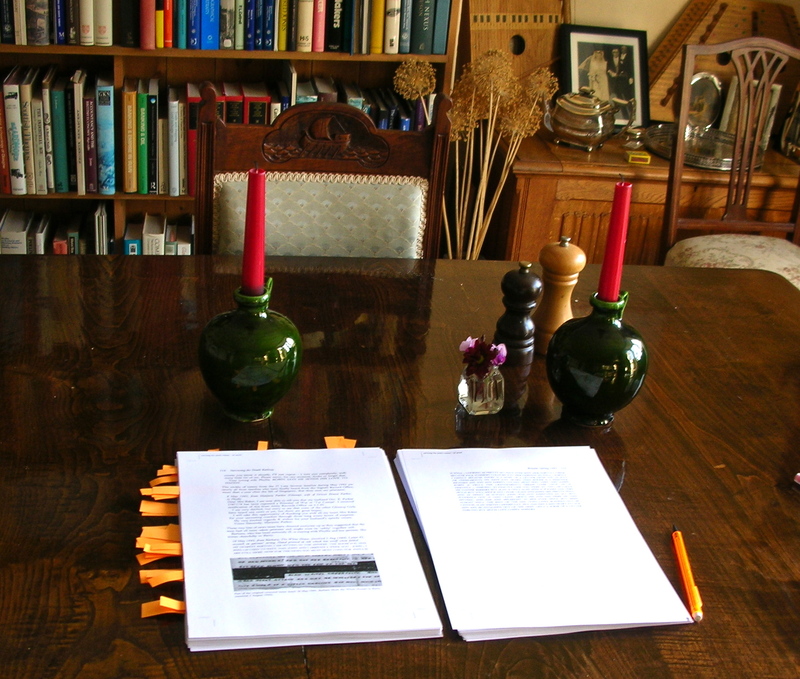 I think there is quite a distance between first proofs and final copy. Oh Hilary, what a wonderful start to the New Year. Congratulation on your new book, I have no doubt that it will be great success. Thanks so much. I am full of doubts at the moment. It is so different from a novel and I am editor, rather than author. It doesn’t feel as integrated as I’d like. I follow all your publishing adventures with great interest. I had to ask Helvi what an Indy publisher is. Just shows I have a lot to catch up with.. I don’t know the fungus but I would not eat it. 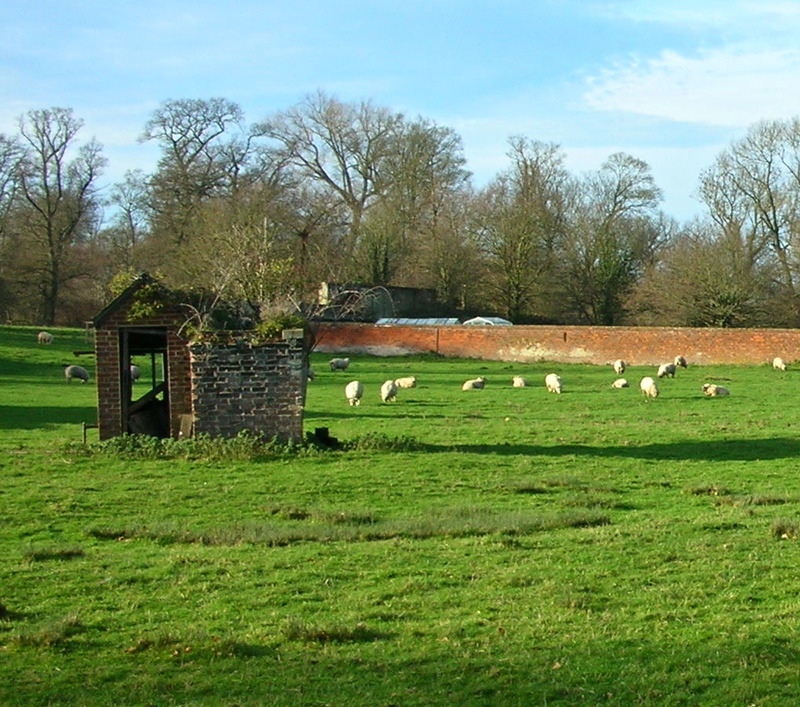 Could the structure be a shepherder’s hut? In my case the Indy was a two man firm and one of them jumped ship half way through the process. I was given 48 hours sight of the manuscript before printing and it was FULL of errors. It could be a shepherder’s hut, but it’s incredibly small. I’m glad you have had a good experience with your publisher, Hilary. A blessing to be much desired. Indeed. I have had to deal with five different people (commissioning editor, manager, copy editor, text-setter and cover designer) and they have all been helpful. What a pleasant experience with a “real” publisher. I think your book deserves the altar you created! It was only when I took the photo that I realised the candles were still there. It’s a good quiet room away from the computer (where I do 90% of my work) and where distractions abound. I am in awe! I too will buy a copy, probably 2 as I have a pal who would be very interested to read it. He is writing his own book on a related theme. I will try to check the fungus tomorrow. As for the building, well I am stumped. Thinking cap on. Thank you, I hope it comes up to scratch. Compiling a book of non-fiction from multiple sources is new territory for me. Reading the proofs has given some jitters, it is so very different from a novel. The start feels slow and complex… however there is no going back now! 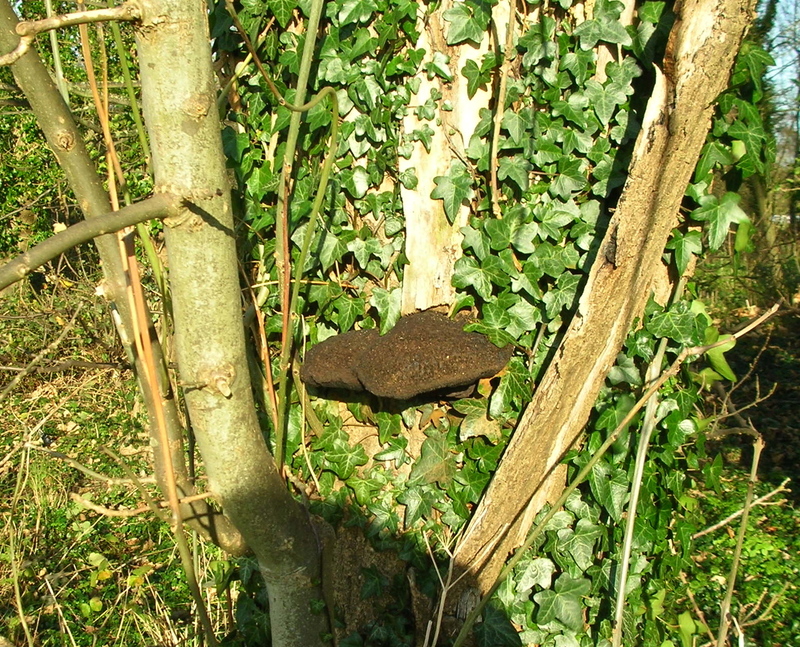 Inonotus hispidus might be a possibility for the fungus. I think you are right. I’ve had a look at various samples online. 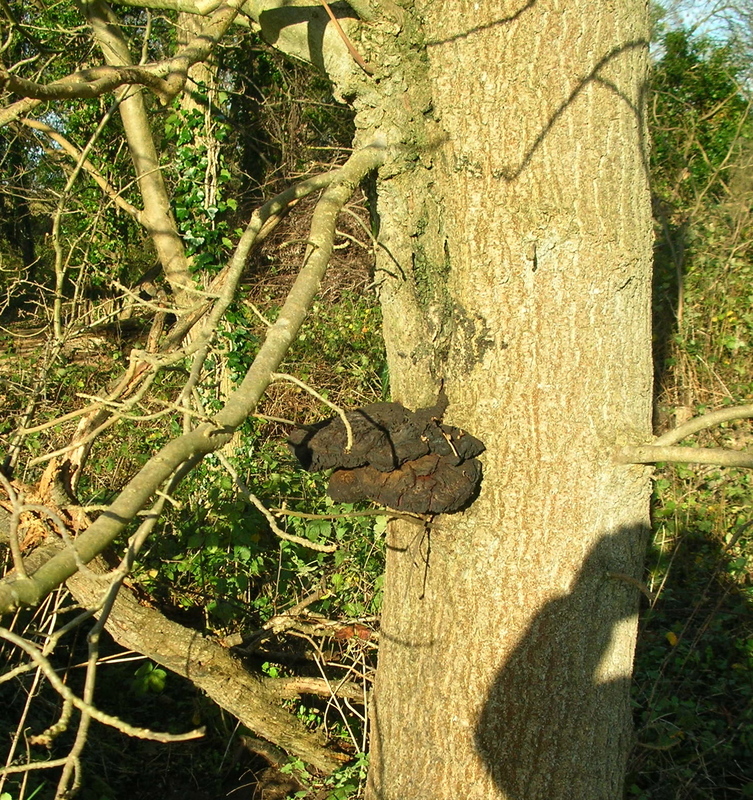 If so this is rather an evil fungus and not good news for the trees that are affected. There’s some notes and a good photo of it two-thirds of the way down this page. That’s very interesting. Ash is under threat from Ash Dieback too. It could be the next Dutch Elm disease. Wonderful to hear your experience has been so positive this time around. I’m excited for you. Continued best of luck with the road to final publication! Thanks. I can’t expect it all to go so smoothly, but it seemed a good idea to enjoy this stage while I could. It’s good to know this book is going so well after all the work you have had with it. Thanks, I now have a print-out with innumerable Post-Its, so there’s a bit more work to do, but there are no real or unfixable problems. Amazing. So glad the publishing venture is going so well for you Hilary. Thanks. I’m feeling a bit dazed by how smoothly it has gone so far. Pen and Sword sound like an admirably professional outfit, I’m glad you’re having such a positive experience with them. I imagine the sort of editing you’re doing must feel like quite a responsibility but I’m sure you’ll do an excellent job. Not that I’ve ever been in a similar position myself, but from what I’ve read, it seems that compromise (on things such as cover design, fonts, layout, etc.) is an unavoidable part of the whole process. I should think there are plenty of publishers who would go ahead with those decisions without consulting the author/editor, or at least not listening to their views. Re: the building(s), the roofed bit seems more recently constructed, doesn’t it? There also seems to be some metalwork attached to the side which makes me think of pipes and I wonder if there is some plumbing involved. Most mysterious. I don’t know what that fungus is but I hope it’s not giving the tree any trouble. Yes, it’s the nitty-gritty editing now (like noticing a father and son in the family tree with the same year of death… should have been ten years difference, and the camp names in Thailand are a nightmare). Yes, P & S have been very open and accommodating, but clear about what they planned. Yes, there do seem to be two phases of building. Next time we walk that way I will climb the fence for a closer look. 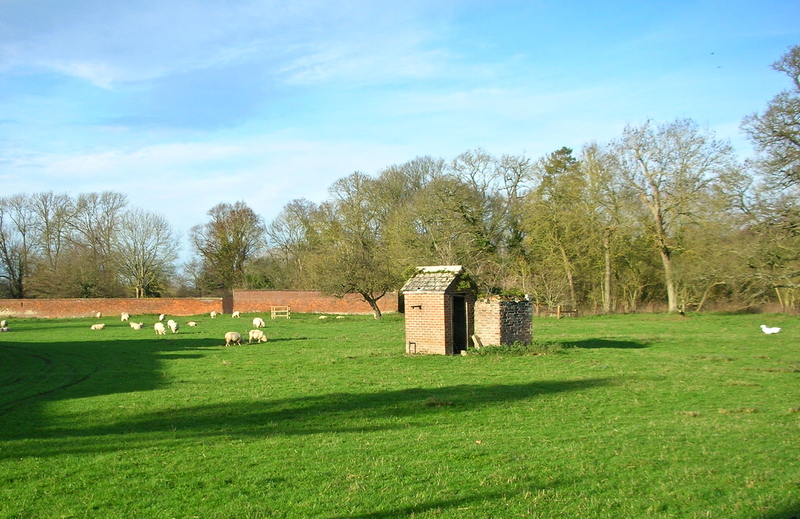 Curt suggested a pump house and Gerard a shepherd’s hut. I’d better find the local historian. Yes, I’m know of how lucky I’ve been with the book. You may be right about the shepherd’s cabin, but as you say, you’s expect it to be more rustic, it is very close to the middle of this tiny village, but every shepherd needs somewhere for their tools or just to get out of the rain. A wonderful and successful 2016 to you and your family, too. March may be pushing it a bit, I think May/June more likely, but I don’t know. Everything is happening faster than I expected. Hi! I’ve just finished Border Line, and I’m glad you mentioned it, in a comment. How did you choose that topic? It strikes me that the only reason I might consider taking my own life is it I knew I was headed for a long, debilitating illness (such as Huntington’s), and wanted to spare my children the burden of the care of the old gal! Thank you so much for buying and reading Border Line. Nothing makes an author happier. I was curious about how people treat others who are guilty of hurting other other people, and how people dealt with their owen perceived guilt. This interest crossed with a brief stay in Ljubljana (and a longer one in Venice), including a crazy day in a taxi with three other people speaking rather too many languages (except the French lady who spoke just the one). The third strand was listening to my theatre director daughter talk about actor’s exercises. All of this meant that when I had written a draft, I needed to go on a ten-day research trip to Slovenia, of course. A belated happy new year, Hilary, and huge congratulations on the progress of your new book. I’d be very interested to hear your thoughts on the pluses and minuses of all your different publishing experiences when you’re done! Thanks, I’ll do that… so far, so good! I, for one, am awaiting your final published works on this historic look into the unparalleled sacrifices of that great generation. Having but TRIED to write a story, I applaud you on your determination and ability to convey his story. I wish you every success. Oh, Koji, I hope it lives up to expectations. I am at that stage where all I can see is the mistakes and the things I failed to put in there. I think you did write a story, with your pilgrimage and blogs about your uncle’s war.